A note on the “wait and see” approach: It is a MYTH that you should just “wait and see” if your child is a “late talker.” The “wait and see” approach can be appropriate in some circumstances, which a speech-language pathologist may even recommend upon seeing your child, however I STRONGLY encourage you to have your child screened or assessed by a speech pathologist if you have ANY concerns with his/her development at ANY AGE. The SLP can determine if the wait and see approach is appropriate for your child or not. DO NOT WAIT UNTIL AGE THREE if you have concerns at TWO! If you have concerns at two, get your child in at two. The advice to “wait until three” is not appropriate for every child and can, for some children, actually be detrimental to their development. A note on pediatricians: Pediatricians are wonderful medical doctors…however they have VERY LITTLE training in speech & language development. They are trained to diagnose and treat medical issues, not speech & language issues. If your gut tells you something is wrong with your child and your pediatrician says to wait, go with your gut. 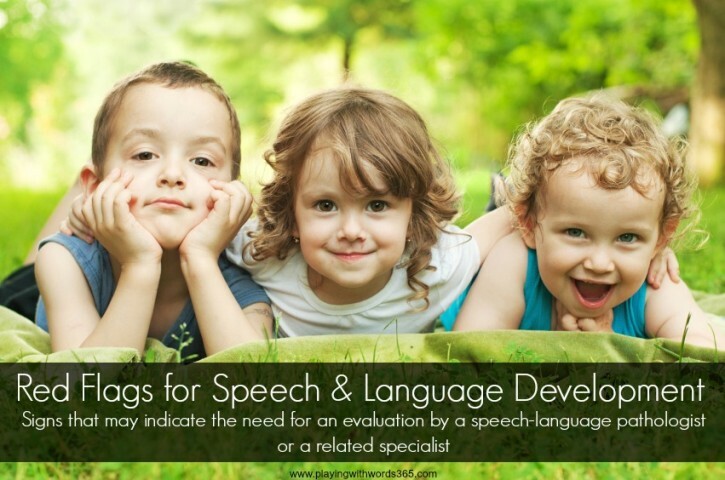 Get your child seen by a speech-language pathologist. With that…here are some red flags that may indicate your child should be assessed by a speech-language pathologist or related professional.